Practising P4C in the UK has involved a lot of choice for teachers. We want to retain that choice but also offer practical guidance and some philosophical anchors in the form of key texts and topics. You may use terms like ‘programmes of study’ or ‘schemes of work’ to describe a sequence of lessons. We use the more general term ‘sets of ideas’. Our sets of ideas are invitations to you and your pupils to philosophise together. This will involve some materials we provide but will also leave you and your pupils free to choose materials yourself, such as stories and images that connect with the key concepts in our sets of ideas. We hope this results in the best of both worlds: guidance plus choice. We don’t tell you how long you should take to get through each set of ideas – that will depend on how regularly you do P4C, how deeply you and your pupils explore the ideas, and how enthusiastic and creative your pupils are. We invite you to use your professional judgement. Questionnaires can be a good starting point for P4C, stimulating both pupils and teachers to think critically about a range of issues. Beauty is a stimulating and valuable topic and it relates to another area of philosophy – aesthetics (the branch of philosophy which deals with questions of beauty and artistic taste). Ideas discussed here could inform other subject areas. The range of choices open to pupils can provide invaluable insights into their interests, preoccupations and attitudes. The materials for this set of ideas are contained in our area for subscribers. However, the link below offers you the notes for teachers to you can see the kind of thing that we are working on. 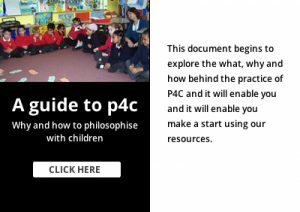 Whether you are an experienced P4C teacher starting out with a new class or a teacher just starting to do P4C, have a look at or our introductory document: A guide to P4C. Click on the image below to access it. Take particular note of the sections at the end: Combining open and focused activities in a series of P4C sessions and A spiral curriculum. This is the sort of curriculum we are aiming for here. Before starting your new year of P4C, it’s a good idea to review the previous year and look forward to the next one. Ask children what they remember from last year and what topics they found most interesting and important. Ask them what they think makes a good enquiry and what they can do you contribute. If your class hasn’t done P4C before, we suggest you begin by negotiating some guidelines with them as suggested on page 3 of P4C: What, Why and How? The section of that document called Steps for open dialogue describes one way of getting to a question by negotiation between a teacher and the children. If you and your class prefer the questions to come solely from children working alone or in groups, then by all means use that strategy. However, we hope you will try out different methods like those we suggest from time to time, taking note of results and involving children in discussing pros and cons. The following sets of ideas for Year 6 pupils are each organised around a topic or key text. Each set has a suggested sequence of activities.